Check out these emoji etiquette tips for your next conversation. Technology is always improving, and so are ways to communicate. Emojis are more than a passing trend; they’ve become a staple in our communication habits. Emojis are fun! However, with all the smiley faces, thumbs up, and dancing twins, they should be used in the proper place at the proper time. 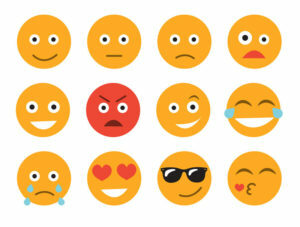 Check out these tips to help you stick to the right emoji etiquette. When using emojis, think about who you’re sending them to. When sending them to close friends and family, you have complete creative freedom. They know your personality and are more familiar with how you communicate. However, if you’re conversing with an acquaintance or a business relation, consider sticking to a basic smiley face or refraining from using emojis altogether. Think about who you’re texting and whether or not it’s appropriate to send an emoji. Preface Emotion When Using Emojis. There are many ways to interpret what an emoji means. When you communicate through text, the reader can associate many tones with your words and special characters. Before sending an emoji, set the tone so that the recipient knows how to read your message correctly. Additionally, refrain from using any emojis when having a serious conversation. Too many emojis can be overwhelming. Limit your use of emojis and place them correctly in a sentence. Think of your emojis as a sort of punctuation. Keep your emojis at the end of a sentence so that they make sense. Use the right emojis at the right time and use these emoji etiquette tips. Get the right insurance at the right time to protect your lifestyle. Contact the professionals at Robert J. Los Insurance Agency to find you the right insurance. Located in Hamburg, New York, we serve all your personal and commercial insurance needs.